We are coming up on the 2011 NFL Draft and it'll be held a little more than three months. 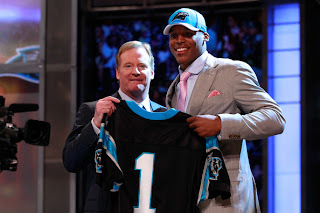 Now that the 2011 NFL season has concluded, let's see how the teams did in their draft picks a year later. This pick had a lot of haters. Many people said that he wasn't worth the pick, he was a sure bust and all that. But boy did he have an impressive season or what. Easily won NFL Offensive Rookie of the Year and was such a threat in the passing game as well as on the run, setting the record for rushing TD's by a quarterback. He has this team on the rise and if they get a defense, they will be a playoff contender. I did not love this pick, I really thought that the Broncos would play him out of position, that he should be a 3-4 outside linebacker because I thought his pass rushing abilities would not be used well as a 4-3 outside linebacker. And boy was I wrong (again). Miller was a beast this season as defensive coordinator Dennis Allen unleashed him off the edge and he won Defensive Rookie of the Year. He and Elvis Dumervil will be a force as a pass rushing tandem. Dareus was very strong on the 3-4 front for Buffalo. He showed good pass rushing skill with 5.5 sacks, pretty solid for a 3-4 defensive end, and he stuffed the run very well. What hurt him a little last season with a shoulder and hand injury but he still started all 16 games, showing toughness. What will be key for him in 2012 will be how he converts to being a 4-3 defensive tackle opposite Kyle Williams. Green was a stud this season in Cincinnati. Teaming up with rookie quarterback Andy Dalton,, they helped revitalize this team and a punchless offense from a year ago. Green was a such a threat down the field with 65 catches, 1,057 receiving yards and seven touchdown receptions. He also earned a Pro Bowl berth as well. Dalton-to-Green will be a feared combination for years to come. Peterson had a fine season as a cornerback, knowing how difficult it is for cornerbacks to adjust to the NFL. But boy, was Peterson breathtaking as a punt returner or what? He tied the record for punt return touchdowns with four including the epic return to defeat the Rams. His return prowess earned him a Pro Bowl berth. Peterson is the next Devin Hester on returns and should improve in coverage next season as well. Atlanta paid a high price to trade up to select Jones and while it did not mean a Super Bowl championship like they were hoping for, they got another home run threat opposite Roddy White for Matt Ryan. Jones caught 54 passes for 959 yards, an awesome 17.8 average, and led all rookie receivers with eight receiving touchdowns. I did not love this pick either initially because of how raw I thought Smith was as well as the fact that they passed up Blaine Gabbert, who I likened to be a franchise quarterback. And that was a double fail because Alex Smith stepped up his play and Smith was a fantastic pass rusher in 2011. He totaled 14 sacks on the season, coming a half sack shy of tying the all-time rookie sack record. Man, I was really hating on this pick. I was not a fan of Locker at all coming out of U-Dub and I really thought that the Titans were making a mistake taking Locker over Gabbert. If you aren't sensing a recurring trend of me being absolutely wrong, it will only continue. Locker only paid in five games, starting three, and while his completion percentage was mediocre nor did he win any of his starts, but he did look poised and confident and did not throw an interception. He looks like a potential solid starter. The Cowboys were looking for some major help at offensive tackle in the draft and while their line as a whole was not fantastic in 2011, Smith was a bright spot. Smith was very solid all year and started every game at right tackle and he seemed to get better with every game. I thought Gabbert was the second best quarterback in the draft and I know that I was alone with that thought. But I was not sold on the team trading up for Gabbert when they already had David Garrard who they would eventually cut right before the season. And boy, Gabbert was pretty awful, he looked easily rattled and his passes were often off the mark. The fine folks at Football Outsiders said that his season was the fifth worst ever for a quarterback. But his line was pretty poor and he was throwing to scrubs so he does deserve the chance to play with good players. Watt was a great selection and played a key part as this defense going about worst to first as they made one of the more successful conversions to a 3-4 in recent memory. On the season, Watt had 56 tackles, 5.5 sacks, 2 fumble recoveries, 4 passes defense and a blocked field goal. And he stepped up his game in the postseason. Against Cincinnati he helped blow the game open with an incredible pick six and he contributed two sacks the next week against Baltimore. Ponder was a nice reach for Minnesota and nobody had him rated as a first round pick, or at least as I remember, but while his rookie season was not a rousing success, he did show some promise that gives Vikings fans some hope. He was inconsistent overall though and as he gets more experience he is going to have to show some more consistency. The Lions were proclaimed to be getting a steal when they took Fairley here, particularly he was thought of at one point being a potential top pick. But Fairley fought injuries all season and when he did get on the field, he was not much of a factor opposite Ndamukong Suh. He missed six games and showed that his foot injury in training camp hampered him all year. Fairley only had one sack and 15 tackles on the season but let's see how he does next year when fully healthy. Quinn did not light the world on fire in 2011 like Miller and Smith both did but he did show plenty of promise in the playing time he received, mostly behind that of Chris Long and James Hall. He showed flashes and one must note that the Rams were often behind and thus not in position to get sacks. On the season he had five sacks and showed talent on special teams, blocking three punts. I was not sold on Pouncey as a center and I thought that he probably would have been better off at guard but by all accounts he had a solid rookie season at center. He started 12 games on the season and was a nice upgrade at the position. Pouncey was not a sore spot at all and he did not make many mistakes. He helped out his quarterbacks with his solid play and looks set at the position for a long time. Another pick I was not sure about, my feeling about Kerrigan was how he would fit coming off the edge in the Redskins' 3-4 because of his athleticism. But again, I was wrong. Kerrigan played the entire season, did not miss a snap, for the Skins and he totaled 7.5 sacks and 41 tackles on the season. He and Brian Orakpo look to be a really strong pass rush combo for a while. Another pick that I was not initially a fan of that made me look stupid. Solder filled in admirably for multiple weeks for Sebastian Vollmer when the latter was injured and did a very good job all season. He also performed well when used as a third offensive tackle whenever the Patriots wanted to go really big. Bill Belichick proved his acumen once again. The Chargers had high hopes for Liuget in his rookie season but while he was not awful on the field, he did not make much of a difference. Of the fifteen games he played in, he had 19 total tackles and only one sack with a forced fumble and two passes defensed. But watching him play, he was not a sore spot on the Chargers' defense but you never really noticed him making plays either. He has to step it up in 2012. I really loved this pick and I thought it was an absolute steal. But Amukamara really did not do much this season for the Super Bowl Champions and that was mostly due to not playing until week 11. He had that interception in his game back against the Eagles but really got burned for much of the rest of the season and was relatively invisible in the playoffs. He needs to be fully healthy in 2012 if he wants to have more of an impact. The Buccaneers desperately needed some help in their pass rush and while their sacks numbers were still not that great in 2011, Clayborn had himself a very fine season rushing the passer with 7.5 sacks and has the makings of a very good all-around defensive end. He also played the run very well all season, key for any defensive lineman. Taylor proved my wrong and proved a very good fit for this Browns' 4-3 defense, even though I really think he is a better fit for a 3-4. He stuffed the run very well, as you expected he would, as teams could not run up the middle against him and Ahtyba Rubin. And he was active in the pass rush as well, with a very solid four sacks. The Colts were an absolute disaster in 2011, going 2-14, but Castonzo's play on the left side was one of the few bright stops. Indianapolis was right around the middle of the league in terms of sacks allowed, 16th, and while that was much worse than in 2011, that low number was due to Peyton Manning. Castonzo solidified the blindside and once Andrew Luck comes the town, he will know his backside is protected. The Eagles' offensive line was much improved in 2011, giving up 17 less sacks than from the year before and jumped to 11th from 29th, and the upgrade that Watkins brought at guard was one of the reasons why. Once the Eagles put Watkins in the starting lineup in week five, the revolving door at right guard was finally shut by the burly 27-year old. The Saints were looking for the versatile lineman from Cal to help upgrade their pass rush. But that did not really happen as Jordan only totaled one sack on the season rushing from the end position. But he did do good work against the run as he finished with almost 60 tackles on the season. But New Orleans is looking for him for some pass rush and he'll need to step up next season. I was not a fan at all of this pick because I really thought it was a reach as I did not think he was a first round worthy player. And while he was not awful when he did play early in the season at right tackle, he was not that good either and looks to be a better fit at guard. What really hurt him was suffering an ACL tear nine games in. I'll give him a passing grade for now. It was not the best of rookie seasons for Baldwin in 2011. He started off on the wrong foot, getting in a locker room fight with Thomas Jones and breaking his thumb and he did not play until Halloween. He seemed to struggle to the NFL game and lifestyle and when he finally got on the field, he did not tear up anybody. He will have to show much improvement in 2012. Smith was hindered by an ankle injury he suffered in week 1 and he was not terrific by any means, even though cornerback is one of the tougher positions for draft picks to adapt to the NFL. He had some high points and some low points but he did finish the season pretty well and he clearly has the talent to create a strong tandem at corner with Lardarius Webb. When Ingram was healthy, he showed plenty of talent to give the Saints their first every-down capable back since Deuce McCallister retired. The problem was that he did not seem able to stay healthy. He missed a nice chunk of time for a heel injury and he then suffered a toe injury against the Colts and had to go on injured reserve. But the promise is absolutely there. I absolutely loved the selection of Carimi by the Bears as he was your classic right tackle prospect and seemed to be the type of prospect that line coach Mike Tice would love. And thus Carimi started the season as the right tackle. But in the second game of the season Carimi suffered a knee injury and was lost for the season so I can't really grade this pick considering how little he was on the field. Wilkerson proved to be very durable all season and he also was a solid even though he could have done a better job keeping offensive linemen off linebackers. But where he needs some work is through rushing the passer. While three sacks is not awful for a 3-4 end, although they got much more pass rush production from Shaun Ellis, he did only have nine quarterback hits all season. He's going to generate more of a pass rush as that was said to be one of his strengths coming out of college. Heyward got more playing time than was expected of him because of injuries and he did not exactly like the world on fire. He played in all sixteen games as a key rotational piece but he only tallied eleven tackles and had one sacks. He did end the season well as he blocked a field goal and recovered a fumble but he is going to contribute much more on the field. Sherrod was a steal where he was selected, or so I thought as the feeling would be he would help provide depth and show pass blocking skill to help out what was a weak offensive line. But he really struggled when he saw the field in 2011. He attempted to switch to left guard early in training camp but that really hurt his development and when he switched back to tackle, he really struggled. His play never really improved all season and it came to an end with a broken leg in week 15.